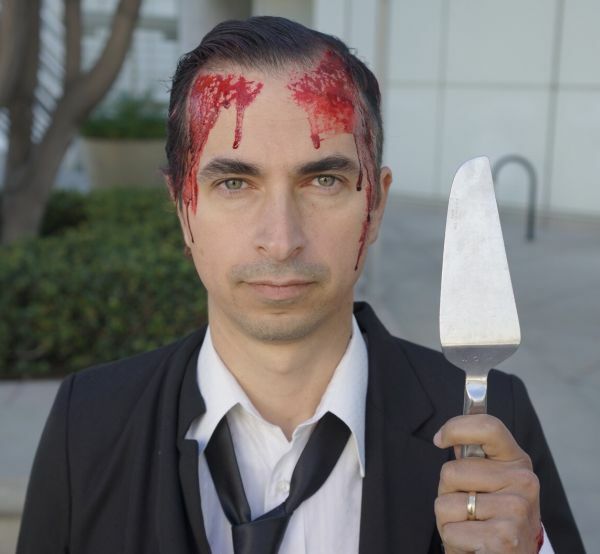 After two decades as the lovingly obnoxious frontman for electro-punks Mindless Self Indulgence, Jimmy Urine has been blazing a new path as a movie and video game composer while the band is on hiatus. A compilation of these works, THE SECRET CINEMATIC SOUNDS OF JIMMY URINE, is due April 28th, which just happens to be a few days before Jimmy will be seen on-screen as the Ravager “Half-Nut” in what will likely be the year’s biggest film, Marvel’s Guardians of the Galaxy Vol. 2 – for which he also secretly composed a piece of “alien music”. THE SECRET CINEMATIC SOUNDS OF JIMMY URINE runs a gamut of styles, from the traditional wacked-out MSI techno-rock sound of “Fighting With The Melody” (from Kasedo Games’s Metronomicon) to classic Chiptune/8-bit game sounds (from from Rising Star Games’ I Want To Be Human), to the creepy “All Together Friends Forever” (from the 2015 horror film The Hive, and featuring Jimmy’s wife Chantal Claret), and then onto to serious electronic compositions that channel his heroes Tangerine Dream and Vangelis.